Java is one of the most-used programming languages in industry today, and it is also the language of AP Computer Science and many college introductory courses. Our Java library allows students to use Java to read sensors and set motors and LEDs with the Hummingbird Bit. To use Java with the Hummingbird Bit, you must connect to the Hummingbird Bit via bluetooth with the BlueBird Connector. You will need a bluetooth dongle. Insert a micro:bit into the Hummingbird Bit. 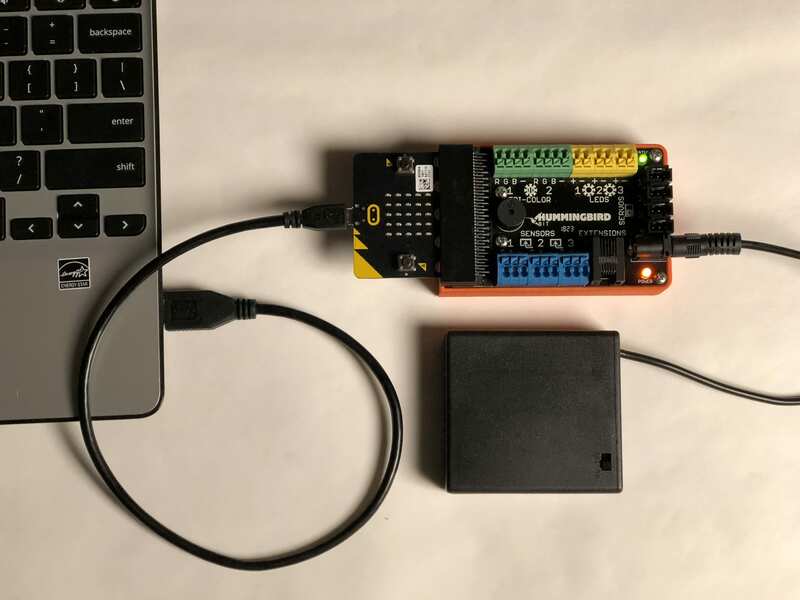 Connect the Bit to power (battery pack or AC power adapter), and connect the micro:bit to the computer with the USB cable. The micro:bit will appear as an external device on your computer. Download this file and drag it onto the micro:bit. The micro:bit will begin flashing three letters on its LED screen. At this point, you can unplug the USB cable from the micro:bit. You won’t need it because you will be using bluetooth to connect to the Hummingbird Bit. Insert the bluetooth dongle into your computer. The bluetooth dongle is required, even if your computer has built-in bluetooth. Open the BlueBird Connector. It will begin finding the robots around you. Click on the name of your robot. Each robot is flashing its initials on the micro:bit to help you figure out which is which. 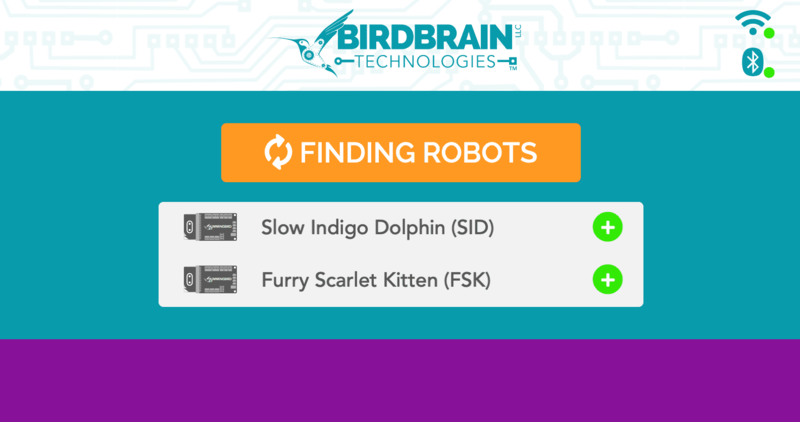 When you connect to your Bit, you will hear a series of tones, and the robot will show up in the purple “CONNECTED” section of the BlueBird Connector. Now you are ready to start programming in Java! You can minimize the BlueBird Connector, but you should leave it open the entire time that you are using the Bit. If at any point you have trouble with your robot, you should come back to the BlueBird Connector to check your bluetooth connection. You can also check your battery level in the BlueBird Connector. You can use any Java IDE with the Bit. The screenshots here will show Eclipse as an example. Download and unzip the Java library. 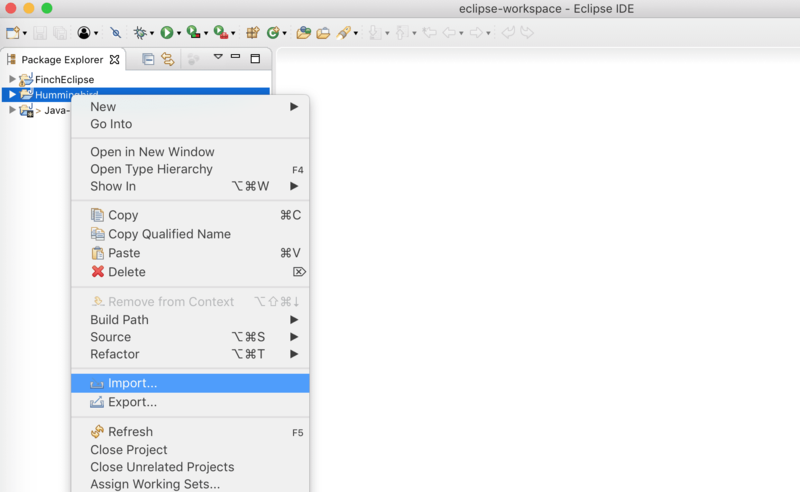 Create a new Java Project in Eclipse. 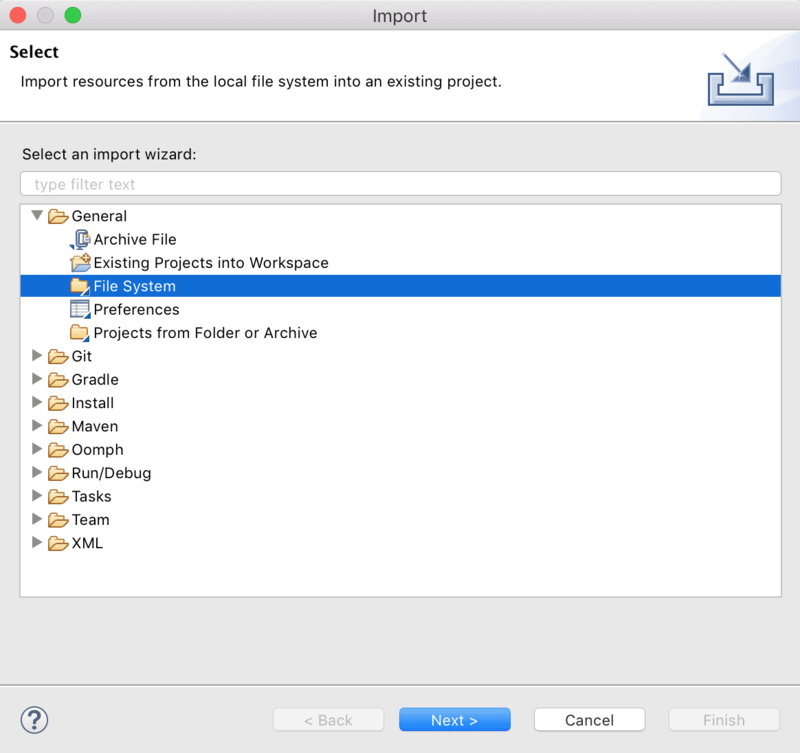 Next, right-click on the new project and select Import. Select File System under General. Click Browse and navigate to the BitJava folder. Make sure to click the checkbox next to the folder name to select all of the files. Then click Finish. 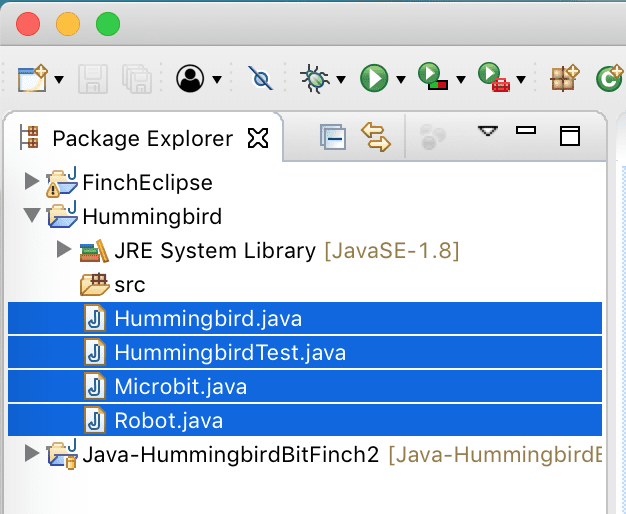 Eclipse will copy four files into your project: the classes for the Hummingbird and micro:bit (Robot.java, Hummingbird.java, and Microbit.java) and a test file (HummingbirdTest.java). Select these files in Eclipse and drag them into the src folder. Note: If you get an error in Eclipse, right-click on the src folder and select New/Package. 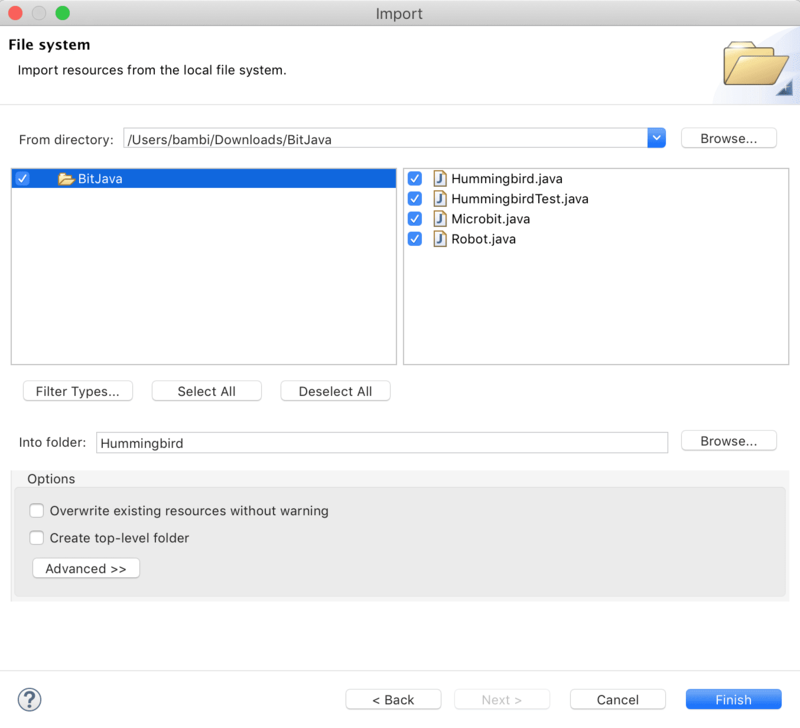 Once you create a new package, drag the .java files into that package. 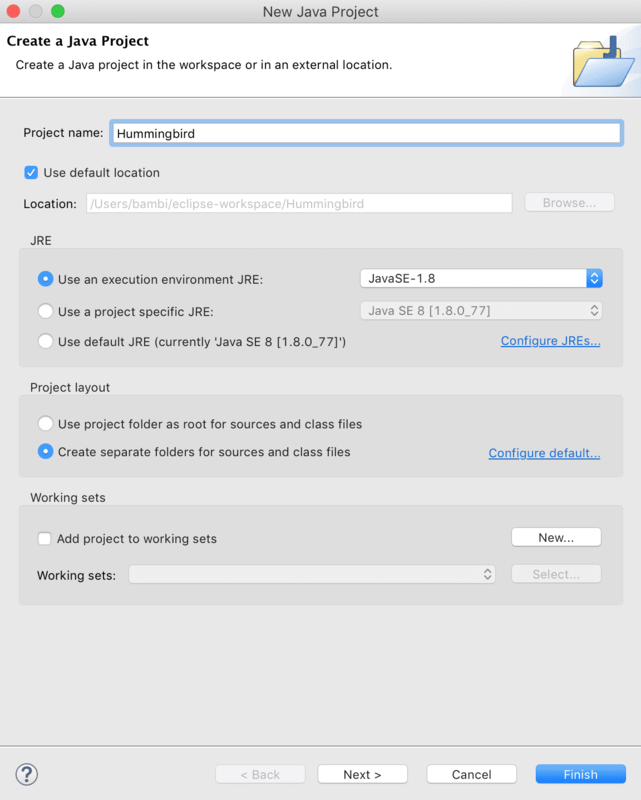 Once the files are in the src folder, open HummingbirdTest.java. To test that everything is working properly, connect a single-color LED to port 1 of the Hummingbird. Run the test program and check that the single-color LED blinks 10 times. Now you are ready to start writing your own Java programs with the Hummingbird! You can use these videos to help you connect lights, motors, and sensors to your Hummingbird Bit. 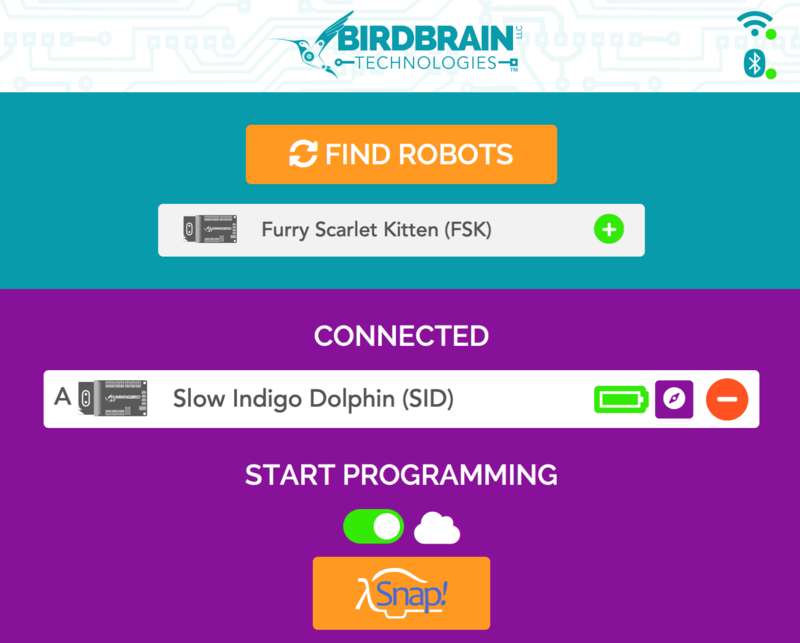 Once you have some parts connected, use this reference to learn more about what methods are available in the Hummingbird and Microbit classes. Make sure to store your programs in the Hummingbird project so that they can find the Hummingbird and Microbit classes. 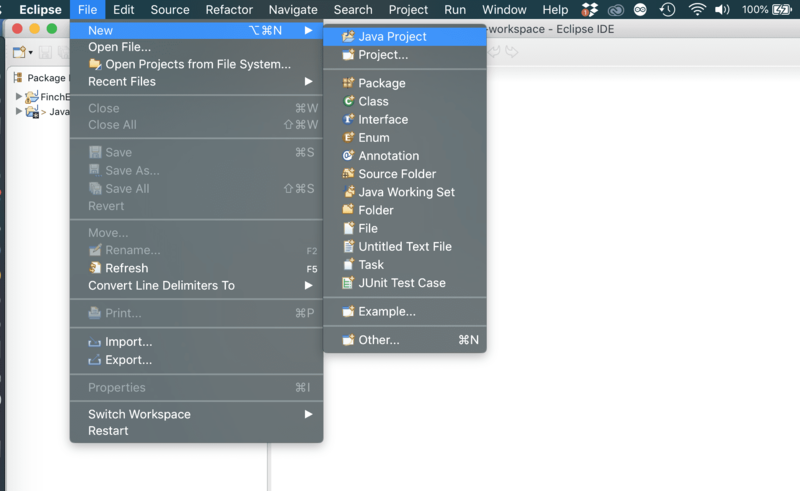 If you wish to create a new project, be sure to add the four files in the BitJava folder to the new project.